A SO news reporter sent to Area 88 to cover the rumor of foreign freelance pilots fighting in the Asranian civil war, he was intrigued by Shin's presence as the only lone Japanese pilot to fight for the Asranian military. One of Rocky's photos, with Shin in the background, was seen by Ryoko in a magazine article on Asran and this convinced her that Shin was alive. He dies in the OVA rendition after he joins a pilot on a patrol, and is shot down. 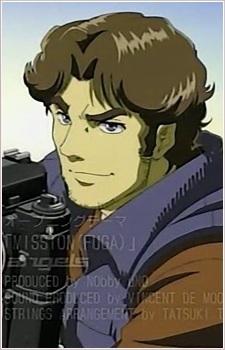 In the 2004 TV series, he survived the series and eventually confessed that his sponsor was Satoru Kanzaki because he wanted to get a photo of Shin's dead corpse as proof to Ryoko that he died in action, forcing her to get married to him. However, he later help thwart the marriage. In the Eclipse comic, he survives being shot down, but is severely injured in the ordeal. Rocky travels the world, apparently having no ties back in Japan, telling the mercenaries that a photographer leaves nothing behind but his camera. Rocky appears (with different names, hair colors and physical builds) in all three versions of Area 88.